So while most people only dish up sprouts as part of Christmas lunch in a dutiful nod to tradition, we tend to eat them all through the winter months. 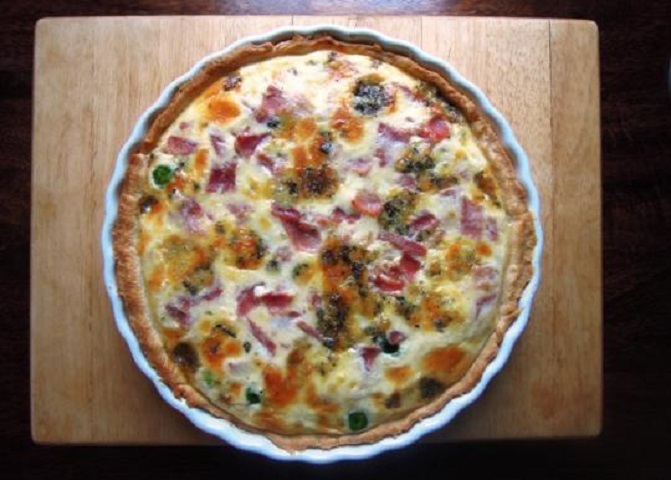 It’s their crunchy nuttiness I love, which I think works particularly well in this tart, teamed with strong, salty Stilton and some lovely smoked ham. And as these ingredients are the kind of foods you find hanging around in the fridge at Christmas time, it also offers an ideal way to use up some of the festive leftovers. To make the shortcrust pastry, sift the flour into a large mixing bowl with the salt. Using your finger tips, rub in the butter until it resembles soft breadcrumbs. Add enough cold water to make the mixture come together to form a firm dough. Cover with cling film and rest in the fridge for half an hour. Lightly flour your work surface and roll out the pastry to line 9 inch well-buttered flan dish. Pop back in the fridge while you prepare the filling. Break the eggs into a jug and lightly whisk with the cream and milk, and season with a little pepper. If you’re not using left-over sprouts, steam or boil them until just tender. Rinse under cold water to stop them cooking any further and to retain their bright green colour. Drain well and then slice each sprout in half. Arrange the sprouts across the pastry base and season with a little salt – not too much as the cheese can be quite salty. Sprinkle over the chopped ham and then crumble over the Stilton. Finally pour over the egg and cream mixture. Carefully place the tart in the oven for about 20 minutes until the pastry is crisp and golden and the filling is set and slightly browned. Serve with a simple salad and enjoy! Here's a new take on a classic hummus, using beetroot to give freshness, lightness and vibrancy. A deliciously colourful dip perfect for those Summer BBQ's, given to you by Expert Home Tips.